The Second Best Things in Life: French inspired corset for outerwear....under $20! So this girl child of mine, who dances and has a love of frivolous fashion beyond the utilitarian fluoro tops and bottoms and galaxy leggings (shudder), has developed a love affair with a store here called Kitten D`Amour. They specialise in French inspired girly dresses, Rockabilly pretties, vintage style prints and silks and satins to die for in petticoats and underthings. 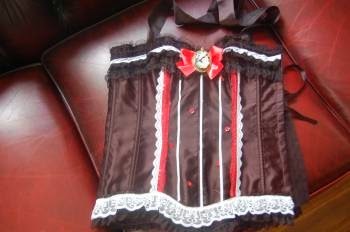 They also do these corsets. The whole underwear as outerwear idea has come full circle. Gosh be darned if I didn't go out dancing in a few Torsolettes in my time. Well, that's what we called them back then. But alas, Mum and Dads bank account cannot possibly sustain multiple visits to Kitten D`Amour, so Mum has had to find a workable replacement. Enter the embellished corset. This little morsel came in plain black with black lace and satin bows and was just $12. It took what felt like 3 years to get here, but in fact we had it in our hands in about 3 weeks. 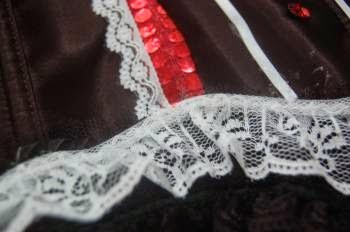 Some slim wisps of white lace to inject a bit of innocence, some red satin and a smattering of sequins for contrast, with a sweet cameo as centrepiece. 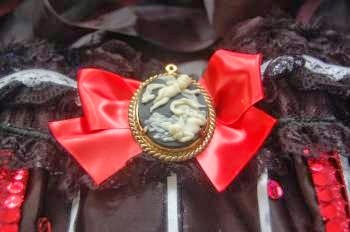 and we've turned our corset into something a little more ladylike. The final touch of white ribbon on the front panel to simulate stripes, and satin ribbon for a halter neck effect, turns this into something worthy of a night at the theatre or a concert or two, all of which are on the agenda within weeks or months. The Girl Child (alas she really is a child no more...*sob*) will pair this with a pencil skirt with cute kick pleats, a little sheer shrug, and high heeled Mary Janes, and be the apple of our eye until she catches the eye of some pimply youth, which is, I have to say, inevitable. This effect was astoundingly simple and inexpensive to achieve and it just goes to show what you can do with a hot glue gun and some stuff from the haberdashery department. Oh, I am so thrilled to have a girl child after three boys. Thank you so much for joining in with the Say G'Day Saturday linky party! Thanks for your lovely comment. Hope you'll give it a try soon..
What a gorgeous little corset top! You did a great job, the cameo is the perfect touch! Love to have you share it with us at WIW. How cute and clever your corset is! Thank you for sharing.